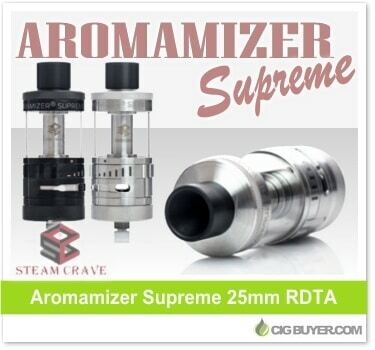 An enlarged 25mm version of the Aromamizer RDTA, the Steam Crave Aromamizer Supreme RDTA houses a huge 16.5mm velocity-style build deck with larg 2.5mm terminals (two on each post), 7ml of tank capacity and top-fill capability. It still offers amazing airflow, with a unique tapered airflow control ring which directs airflow directly to the deck to create a RDA-like experience. It has seven juice flow control settings and direct liquid feed which allows for independent filling and wicking, while also enabling vertical coils.